The new EG Gray makes a fresh move for communities! EG Gray owner Rob Tanguay (pink shirt) and EG Gray driver Jim Burgess (left) with Food Banks Canada volunteers prepare to deliver fresh food to communities across southern Ontario. 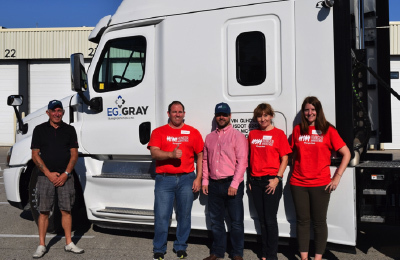 For Rob and Julie Tanguay, owners of Peterborough-based EG Gray Transportation, it was a no-brainer. When they heard that employees of PepsiCo had organized a food sorting event in conjunction with PepsiCo’s major food funding donation to Food Banks Canada, they wasted no time getting involved. So on September 22, a sparkling EG Gray tractor and 53’ reefer trailer showed up at the Toronto Congress Centre to collect 7,500 pounds of fresh root vegetables bound for Toronto’s Daily Bread Food Bank, North York Harvest, Mississauga Food Bank, Barrie Food Bank, and Feed the Need Durham – all transportation compliments of the EG Gray team. “This is a great way to make a difference in our communities, while at the same time supporting a charitable project of our good customer PepsiCo” said Rob at the event. Added event organizer Craig McGurn, Manager National Food Sharing at Food Banks Canada, “We are very appreciative of the trucking industry, specifically EG Gray Transportation for providing transportation for this project. We depend on support like this to provide food to those in need”.